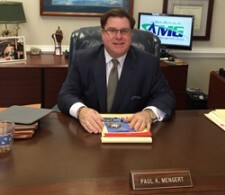 Paul Mengert of Greensboro/Winston-Salem HOA Management Company, Association Management Group, Receives 100% Satisfaction Rating | Company Newsroom of Association Management Group, Inc.
September 2, 2015	(Press Release) - Paul Mengert, President of AMG, Association Management Group, one of the Carolinas' largest professional homeowners association managers with five offices in North and South Carolina, was awarded high marks in a satisfaction survey evaluating his advanced class in community association management for the Community Associations Institute (CAI) in Houston, TX. He recently presented the continuing education course on management company administration to seasoned association management company managers and senior executives. His session on increasing the efficiency and effectiveness of a community management company through better budgeting, management ethics, contracts, and team recruitment, training and retention scored a high rating of 100% overall satisfaction. According to participants, the class was "One of the best I have taken," "Absolutely a must for both new and established management companies" and "Very motivating." Another called Mengert, "An excellent and informative facilitator who provided very good examples with the materials." "Our goal at AMG is to ensure community and homeowner associations and their member residents receive superior, reliable service and equitable treatment," Mengert said. "It's gratifying to learn that these best practices for operational excellence are helping make the jobs of our colleagues in the industry easier and more efficient and, ultimately, creating strong, healthy communities." AMG is considered a national standard-bearer in the industry for best practices and technology; Mengert has taught dozens of both introductory and senior level courses through the years around the US.